An FCC filing discovered on Saturday reveals in-depth details on Apple's first dedicated iBeacon-compatible beacon hardware, suggesting the company may soon introduce the micro-location technology to consumer spaces like so-called "smart homes." Filed with the U.S. Federal Communications Commission's Office of Engineering and Technology (OET), the original equipment application is the first clear sign that Apple is testing an in-house hardware solution for its location-aware iBeacon technology. The document was spotted by Securifi and subsequently reported by TUAW. 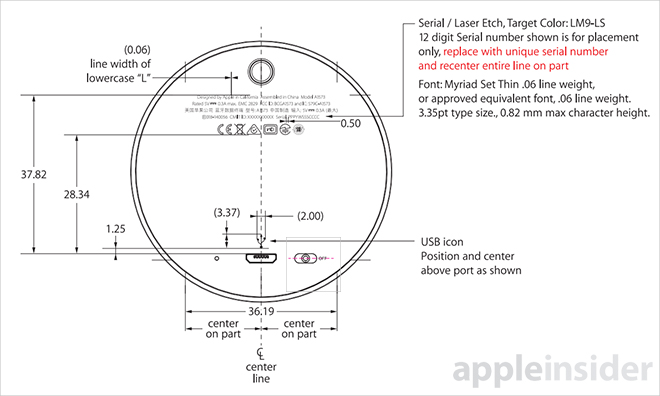 According to the OET's paperwork, the device is labeled "Apple iBeacon" and carries the model number A1573. Hardware testing was performed at a facility owned by Chinese company Audix Technology, which ran assessments using a conducted shielding enclosure, a semi-anechoic chamber and other specialized equipment at the end of April through mid-May. With an operating range between 2402MHz and 2480MHz, and peak working frequency of 2.4GHz, the device looks to be in line with Bluetooth protocol specifications. Testing passed in all areas, including three selected frequencies: 2402 MHz, 2440 MHz and 2480 MHz. Apple's iBeacon uses a combination of specialized Bluetooth 4.0 beacons and wireless data connectivity to offer location-based content services to compatible devices like an iPhone or iPad. Bluetooth Low Energy beacons can vary transceiver sensitivity, thus enabling location-aware deployments by controlling the system's effective range. For example, visitors in an Apple Store can be notified of special deals and product information, or request help from a specific location when their iPhone discovers a placed iBeacon. Store owners can also use data sent by users' handsets to monitor any number of metrics, including customer traffic. Aside from dedicated hardware, Apple's iBeacon platform can turn any capable iOS device (those with Bluetooth 4.0 support) into a temporarily discoverable beacon. While Apple developed the technology behind iBeacon, companies rolling out services based on the platform use hardware made by third-party vendors. Even Apple itself uses Qualcomm Gimbal products in its brick-and-mortar stores. If the device launches, it remains unclear whether Apple intends for the product to be marketed to consumers or businesses. While mere speculation, the small beacon device could work well with an upcoming iOS 8 feature called HomeKit. A framework for "smart home" hardware and software makers, HomeKit brings monitoring and control of connected devices like lights, A/V equipment and appliances together under the iOS umbrella. It has been theorized that Apple could debut a new Apple TV model that acts as a hub for HomeKit-compatible products. Going even further, Apple's rumored "iWatch" is said to incorporate BLE, which suggests iBeacon support. With iBeacons installed throughout a home sensing users' iPhones or iWatches (which would likely be worn 24 hours a day), and Apple TV handling connected device and appliance control, a HomeKit-iBeacon setup could be one of the most granular automated home ecosystems on the market.